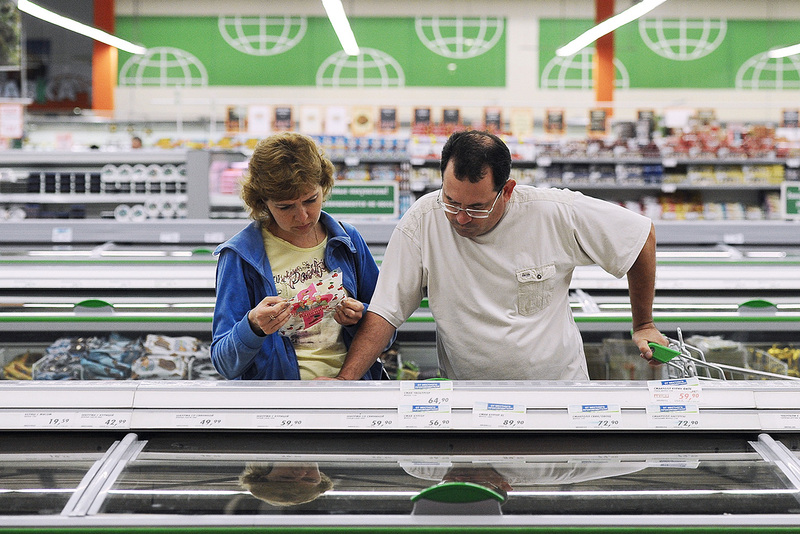 Customers shopping at the Globus hypermarket in Ryazan, Russia. As consumer prices grow, so does the number of Russians cutting their spending. While everyone finds their own way to save money, the food, clothing, and tourism industries are feeling the squeeze. Last year was a real challenge for the majority of Russians. The economic crisis accompanied by growing consumer prices and falling incomes plunged many into panic mode. A year later and the situation is not much better. Despite the fact less Russians are cutting their overall spending (82 percent today, 89 last year), the public is still spending less on many household items and holidays, among other things - as data collected by the Romir research company showed in June. Below is a list of five items that Russians have cut their spending on the most. Food is usually the first thing people scale back on in times of economic crisis. While the number of Russians who have slashed spending on food decreased by four percent compared to last year, it still remains the most popular thing to save money on. Thirty-nine percent of Russians are still feeling the pinch in the supermarkets and choosing to spend less - mostly the residents of big cities and pensioners. The second most popular way to save money in Russia is to buy less clothes and shoes. Compared to last year, when 31 percent of the public denied themselves a new pair of boots and a nice new dress, this year showed a slight increase: 33 percent. Looks like more Russians are dusting off those old, worn jeans more often. This has unsurprisingly had a knock-on effect on big brands, with many leaving the Russian market. Mexx and Monsoon Accessorize recently announced they are ceasing their activities in the country. Desperate times call for desperate measures and 30 percent are now spending less on holidays. This is an increase of nine percent compared to 2016, with fewer Russians opting for resorts abroad over vacations on home soil. Last year nearly 16 million Russians flocked to the beaches of the Black Sea - this year this number is forecasted to grow to around 21 million. People are also saving money on entertainment. Like travel, 30 percent of Russians are opting to watch movies at home rather than go to the cinema. Although free alternatives in Moscow are easing the pain of missing out on the next superhero blockbuster. Many people are cutting back on the sweetest things in life: Yes, cigarettes and alcohol. Twenty-one percent of Russians now have better functioning livers and cleaner lungs - which is only a good thing! Last year, only 15 percent of Russians chose to buy less of the good stuff.